TMU President Dr. John MacArthur will be the speaker at this year’s event. Commencement exercises will be held in the athletic stadium. Guest parking use lot 7 & 8. The gates to the athletic stadium will open at 6:00 pm for those with tickets while general seating begins at 6:30 pm. Each student will be given 12 tickets with their Caps & Gowns. Graduation photographer - Ultimate Exposures, Inc - Click here. Schedule an appointment for an optional portrait sitting (not included in graduation fee) on May 1st at the Master’s University, MacArthur Conference Room. Appointments are made through the vendor as early as March 5th. Graduation Announcements - CB Announcements - Click here. Graduation Practice (mandatory for all graduates): May 10th, 9:30-11am, MacArthur Center. All graduates planning to walk in the graduation ceremony must attend this practice. Please dress appropriately for walking across the stage. You will sit in one of four sections by major and last name. There will be signage to direct students that morning and an email will go out a few days beforehand showing you which section and seat you will be sitting in. You will be guided by one of four section leaders to an assigned seat that will simulate where you will sit later that evening. Faculty/Graduate Luncheon (for traditional Undergraduate students): May 10th, 12-1:30 pm. An RSVP email will be sent to your TMU student email in April, please respond to that email. Departmental Pictures: May 10th starting at 4:45pm at COC. Please arrive at the picture area 15 minutes ahead of the schedule below (to be provided soon). Plan ahead. Allow for finding the parking lot, traffic, lost tassels, visiting family & friends, buying snacks on the way, etc. Avoid stress on that day by being on time to this important and special event. Do not leave any personal items such as purses, gifts, Bibles in the department picture area. All items left behind will be turned in to TMU security. Please report to the upper field behind the tennis courts according to the following schedule: (to be provided soon). Graduation Line-Up: May 10th, 6:30pm SHARP! 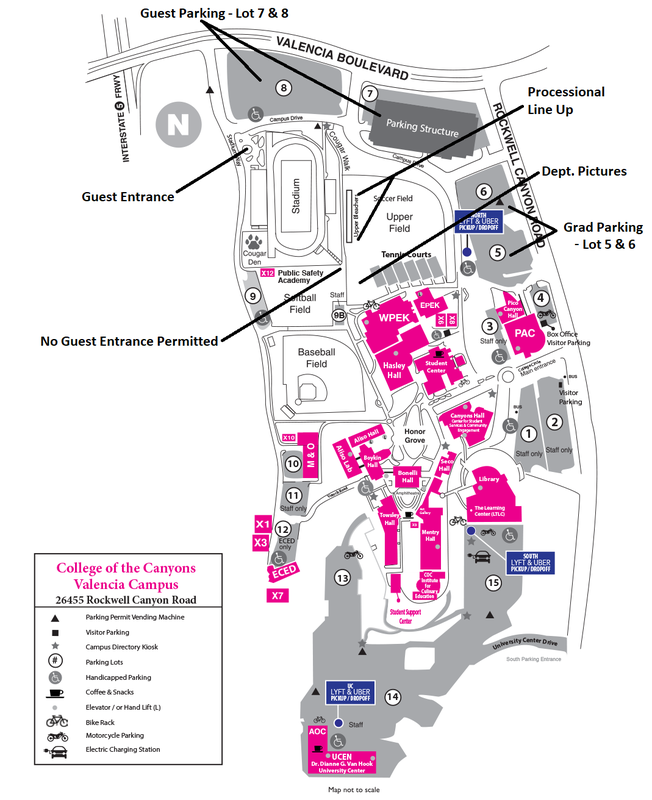 You will line up at 6:30pm on the upper field visible from the department photo area (at COC). If your department picture is finished you may leave, but be sure to return and be lined up by 6:30 sharp. Events for guests: The commencement ceremony is the only planned event for guests. Students visit masters.edu/seniors for a list of your required/optional graduation events. Parking: Please park in Lots 5 or 6. Encourage your parents, grandparents, and friends to park in Lots 7 or 8. Guest Seating: You will be given 12 tickets with your cap & gown. Ticketed seating begins at 6:00. Gates are opened for all guests at 6:30. The ceremony begins at 7:00 and will be over between 8:45-9:00. Handicapped & Disabled Seating: Guests with special needs may sit with one or two others on the track in a specially designated area. The space is limited and not intended for entire families. No strollers are allowed on the track. Recording: The university will be recording the ceremony and a digital copy will be on YouTube as part of your graduation fee. Regalia: You will be given a graduation gown, hood, cap, and tassel. Please take care to prepare the gown by removing it from the bag early and either ironing it on a cool setting or hanging it out to remove the wrinkles. We want to present a dignified ceremony to our guests. Honors medallions are worn under the hoods. The instructions for wearing the hoods are in the bag the hood comes in. The tassels start out dangling on the right side of the cap and are moved to the left when instructed during the ceremony. Post Ceremony Celebration: You may gather with friends and family on the field after the ceremony. The TMU Alumni Association will have an area set up for a photo shoot if desired. Local hotels and motels - Click here.